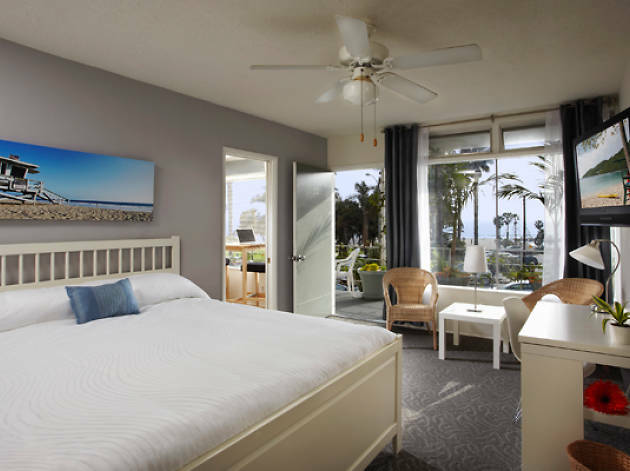 This homey Ocean Avenue hotel has the vibes of a ‘60s surf bum motel, pairing modern amenities with a laid-back atmosphere for couples and families looking to explore Venice and Santa Monica. A low-slung white stucco building flanked by towering palms, the Bayside Hotel looks about as quintessentially SoCal as you can get. The coastal theme continues in the rooms, where a blue-and-white design scheme is complimented by beachy adornments like ceramic swimming fish wall hangings and photos of the boardwalk, plus pale wood detailing. The vibe is a bit retro, but each room also includes modern amenities like flat screen TVs and free wifi. Chief among the hotel’s most appealing qualities is its location: nestled on the border between Santa Monica and Venice, the Bayside is adjacent to plenty of attractions. If you have a hard time whittling down your itinerary, the 24-hour front desk is happy to offer suggestions around-the- clock. Both the hotel and Santa Monica adhere to staunchly chill vibes, so this is the perfect place to spend a few days unwinding. For in-house R&R, Bayside’s grassy terrace houses a fleet of reclining beach chairs for soaking up the rays and sipping cocktails after dark. Location: Two blocks from the beach, the Bayside is in a prime location for both lounging in the sand and living it up at bars and restaurants dotting nearby Main Street and Abott Kinney. The relatively new MTA—which has a station in Santa Monica—makes the entire city more accessible than ever before, though you’ll find plenty to do if you forgo heading east, too. Abbot Kinney: A few blocks from Main Street you’ll find Abbot Kinney, a posh boulevard of designer shopping and buzzy new restaurants. If your stay falls on the first Friday of the month, Abbot Kinney turns into a mile-long block party complete with art, music and some of L.A.’s finest food trucks. The Del Monte Speakeasy: This historic Main Street watering hole was established in 1915 and operated as a speakeasy throughout the prohibition era. While its updated its cocktail menu, the Del Monte’s events calendar is a nod to its past: with jazz, vaudeville and crooners nightly. Venice Beach Boardwalk: Head to the beach for prime people-watching among Venice’s famously bohemian crowd. Rent skates, grab a corndog, or pick up souvenirs in this kitschy beachside marketplace that seems delightfully stuck in the early ‘90s. 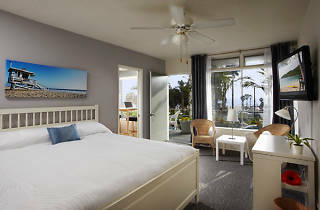 Good for: The Bayside Hotel’s easy, breeze atmosphere and proximity to attractions make the hotel especially appealing to families, though anyone looking to explore Venice in comfort would be wise to book a room. Time Out tip: Ask for a room with a view of the ocean—trust us, watching the sunset from bed is better than anything on TV.